It is often the simple and uncomplicated things, that inspire us the most. 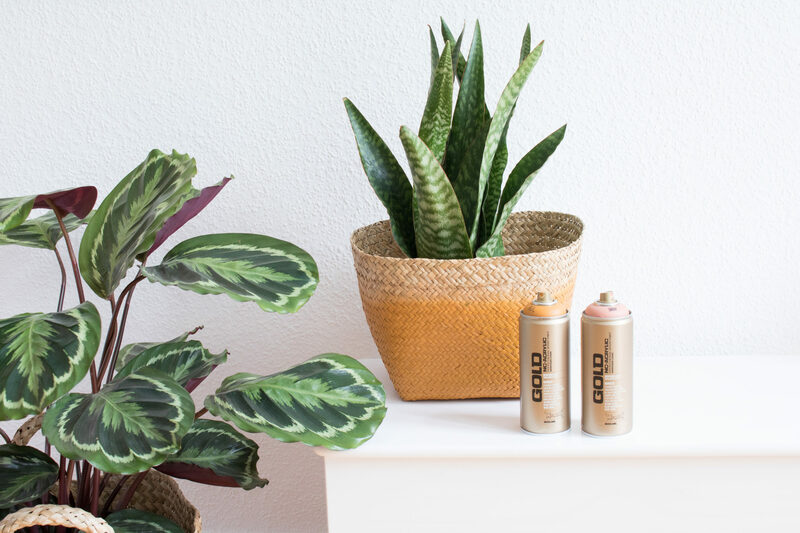 Nature is always a bearer of simple beauty, which is why plants around the house are not only comforting, they add color, life and they are also aesthetic. That gave us an idea. 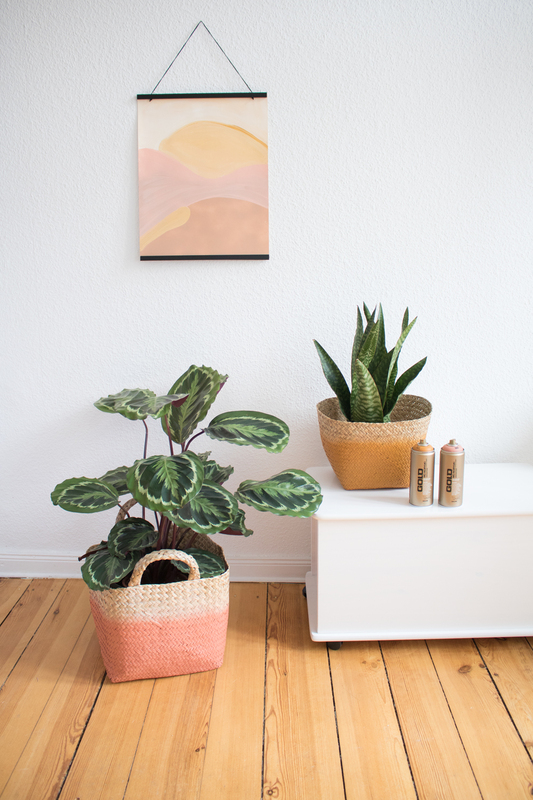 What if we were to pimp our pot plants, with natural materials using nature inspired colors. And cane baskets were the perfect base for our project. So off we went to find some materials. We had a set of three woven cane baskets in cupboard that had been begging for a reason to come out. Today was their day. If you don’t have any, try your local home decor store, hardware store or online. Make sure they are dry and clean of any dust. Prepare your spraying space with a drop sheet or old newspaper to cover the floor and walls around you from over spray. If it’s a nice day you could paint outside so you only need to cover the floor space you are working on. Put on your gloves and your mask. Go and grab your Montana GOLD cans and your nearly ready to play. Shake them for 2-3 minutes. Turn them upside down and remove the nozzles. Let the little black safety ring underneath them fall out. Re-applied the nozzles and give them a little squirt test spray away from any surfaces. Or even better do this outside. Place your first basket on its side, start from the bottom up and slowly apply paint to approximately the middle of the basket. Make sure to leave an amount of unpainted cane as to your taste. Let this dry 5 minutes and turn the basket over to paint the other sides. 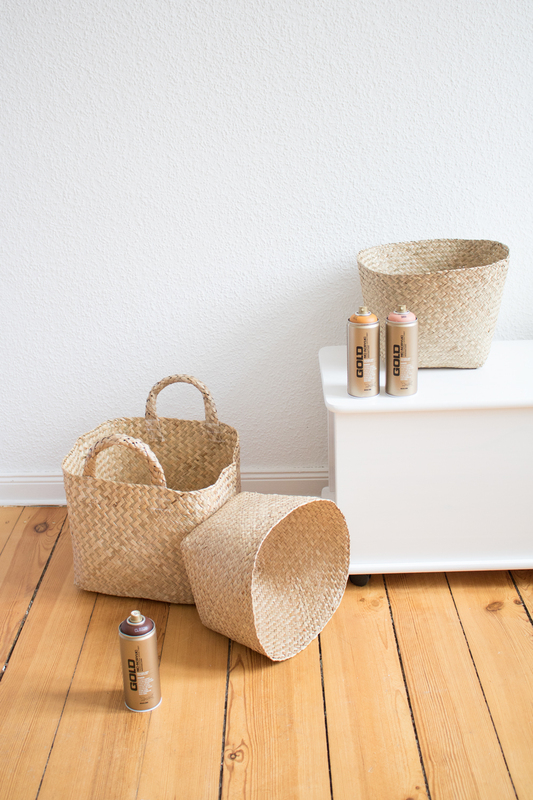 Once your basket has dust dried, put it aside to dry thoroughly and repeat these steps for your remaining baskets. You can use as many or as little different colors as you want. 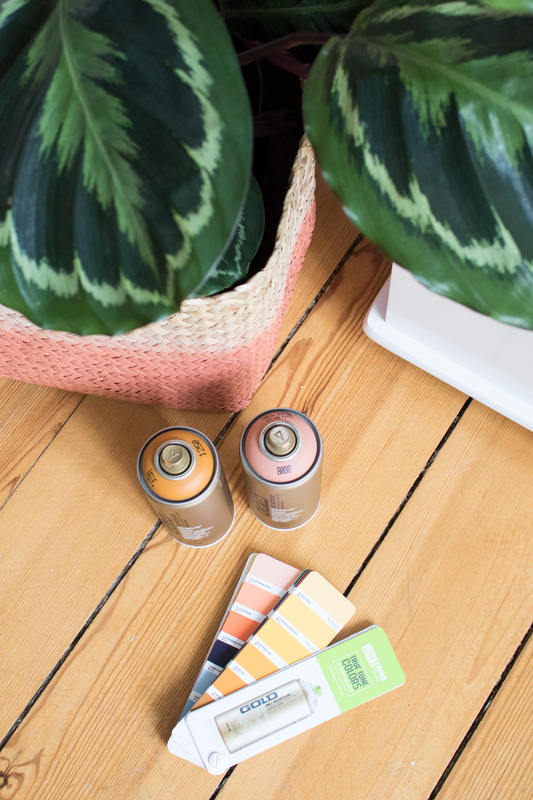 We chose the Montana Cans colors Dirty Apricot, Chestnut, Terra and Manila Light for their natural ambience. Leave the baskets to dry over night before putting your pot plants in them. And then get creative as to where you place them, and in combination with what. This project is Easy-Peasy. It’s for anyone and everyone. The actual working time is only approximately 5 minutes. 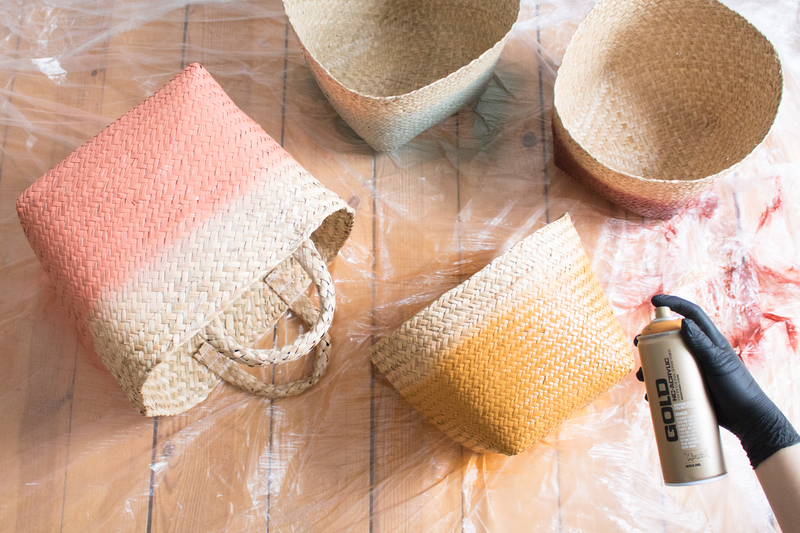 Just remember to allow the paint to dry before turning the baskets over to paint the other sides. Or if you are working on one drop sheet, allow enough space so you can move all around each basket without getting over spray on the others. Good luck and happy crafting!